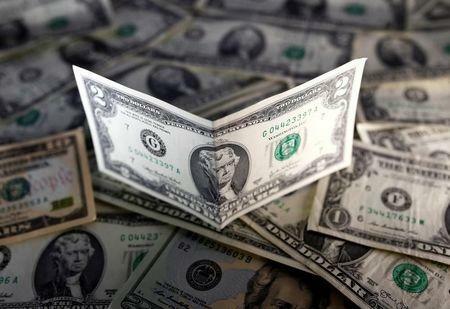 NEW YORK (Reuters) - The U.S. dollar index touched a near 14-year high on Wednesday, while oil prices fell in a volatile session as traders were caught between a build in U.S. stockpiles and the chance of an agreement on an output cut. On Wall Street, declines in bank stocks more than offset gains in the technology sector. The S&P 500 had ended on Tuesday at a 10-week high while the Dow industrials set a record close, fueled by a post-U.S. election rally. "People with money on the sidelines are looking for a place to put it. They're looking for names that haven't rallied as much and ones that have rallied are taking a bit of a breather," said Paul Hickey, co-founder at research firm Bespoke Investment Group in Harrison, New York. The dollar has surged in the past week, tracking Treasury yields higher on the expectation that increased U.S government spending could trigger higher inflation and force the Federal Reserve to tighten monetary policy more quickly than expected. The Dow Jones industrial average <.DJI> fell 54.92 points, or 0.29 percent, to 18,868.14, the S&P 500 <.SPX> lost 3.45 points, or 0.16 percent, to 2,176.94 while the Nasdaq Composite <.IXIC> added 18.96 points, or 0.36 percent, to 5,294.58. The pan-European FTSEurofirst 300 index <.FTEU3> fell 0.21 percent, while MSCI's gauge of stocks across the globe <.MIWD00000PUS> edged down 0.11 percent. Emerging market stocks <.MSCIEF> rose 0.7 percent but remained near a four-month low hit Monday. Oil prices fell in choppy trading as the market weighed Russia's comments on a possible meeting with Saudi Arabia about output cuts against a bigger-than-expected U.S. crude storage build. U.S. crude last fell 0.9 percent to $45.41 a barrel and Brent traded at $46.42, down 1.1 percent on the day. Crude had risen more than 1 percent after a statement from the Russian energy minister. U.S. President-elect Donald Trump's plans to cut taxes and increase infrastructure spending could boost economic activity while adding to the deficit, and his proposals to deport illegal immigrants and impose tariffs on cheap imports are seen driving inflation higher. That prospect triggered a selloff in U.S. bonds that lifted yields across the board, and raised expectations that U.S. interest rates will rise faster than previously anticipated, giving support to the dollar. U.S. interest rate futures are pricing in an 81 percent chance of a rate hike of 25 basis points at the next Fed meeting, scheduled for December. The dollar index, a measure of the greenback's value against a basket of currencies, hit 100.57 <.DXY>, its highest since April 2003. It was last up 0.14 percent at 100.37. The euro fell 0.3 percent to $1.0686, while the yen was little changed at 109.09 per dollar, having earlier fallen to 109.75. The greenback rose to an eight-year high against the Chinese yuan of 6.8798 yuan . "The market has gone a bit too far ahead of itself. It looks vulnerable for a short-term pullback," said Mazen Issa, senior currency strategist at TD Securities in New York, referring to the dollar rally. The recent sharp gains in the dollar may cause Fed policymakers to reconsider raising rates because of its repercussions on U.S. exports, analysts said. "It's reaching its limit. It could feed back negatively on U.S. growth," Joachim Fels, global economic adviser at Pimco, said at the Reuters Global Investment Outlook Summit in New York. Weaker-than-forecast U.S. producer prices and industrial production data on Wednesday supported Treasury prices and capped dollar gains. Benchmark 10-year notes last rose 6/32 in price to yield 2.2172 percent, down from 2.238 percent on Tuesday. Spot gold fell 0.0 percent to $1,224.80 an ounce. U.S. gold futures rose 0.04 percent to $1,225.00. Copper fell 1.7 percent to $5,433.15 a tonne.